The question that I get asked most often at gigs is how did I come to play jazz violin - I guess people are intrigued as we're a pretty rare breed these days. So I've been thinking back over how I got to this point and trying to figure out my jazz violin story. To begin with, we had a number of jazz records at home - Scott Joplin, Louis Armstrong, Chris Barber, Ella Fitzgerald, Nat King Cole and an album of songs from the war years, featuring British Dance Bands and singers. I loved listening to them, along with everything from Handel's Messiah and ABBA to The Laughing Policeman that were also in the collection! In my second year at primary school I was surprised one day to be called to the Headmaster's office - I was a good girl then and couldn't imagine what I might have done wrong. As it turned out, I and a handful of others were ceremoniously summoned to be offered the opportunity of free violin lessons. Mr Barron, clearly enjoying this happy task, asked us did we want to be the next Yehudi Menuhin or Stephane Grapelli? I just smiled politely and looked confused, not knowing who either of them were, but grabbed the chance with both hands. I loved my violin from day one - I still remember the slightly musty, woody smell when I opened the case of my first school fiddle. I practiced, simply because I loved doing it - I enjoyed the feel of the instrument and bow in my hands and the sound it made. While I was working my way through Tune A Day Book 1 and Grade exam pieces, in the bedroom next door my big brother was teaching himself to play the guitar by listening to Jimi Hendrix records. As we got older and got to grips with our instruments we started playing together - all sorts of stuff; Beatles songs, folk tunes, and the odd jazz standard. As a 13 year old I'd go along to his college music nights and play a couple of party pieces, Summertime being a favourite. By this time I'd found out who Yehudi Menuhin and Stephane Grapelli were - they'd both been added to the household record collection and I also regularly received tapes from a teacher at school with interesting combinations such as a Dvorak Cello Concerto on one side and a live recording of Stephane Grapelli in concert on the other. When I was 16, and as impressionable as anyone else of that age, within the space of a month I saw Nigel Kennedy play the Four Seasons and Stephane Grapelli playing with Alec Dankworth and Martin Taylor at Sunderland Empire. I met both of them, shook their hands and brought home autographs, along with a teenager's passionate determination to become a violinist! That same summer I finished my GCSEs, stuck a pick up on my violin and joined my brother's rock band The Rye. I spent the next 10 years touring Britain and Europe in a succession of transit vans and recording our original material on an independent record label. I had never enjoyed the hierarchy and politics of orchestras that came with the free music service lessons, and felt so much more at home in a band playing bars, art centres and student unions. I travelled, met many wonderful people - other musicians, music fans, promoters and those special people who offer their hospitality to travelling musicians; and I got to feeling more at ease on a stage than anywhere else. In between tours I carried on studying classical violin and for the first time at 19 went to a really excellent violin teacher, Noel Broome, who made me realise there was a lot of work to do on my technique. I worked at my unaccompanied Bach and Kreutzer studies and sorted out my bow arm. After 10 years of fun, things began to wind down with The Rye and I decided it was time to take the degree I'd always said I would when the time was right. I spent the next four years having a marvellous time at Newcastle University music department, practicing more than I ever had in my life before and finding a very special violin teacher in Joanne Green who taught me how to solve my own problems and that anything is possible if you practice right. I took every performance opportunity going, dipping my toe into the worlds of contemporary music, Baroque violin, North Indian Classical music, Free Improvisation, electro-acoustic composition, Funk Fusion along the way. While I was studying at Newcastle I was approached by bass player Mick Shoulder and guitarist Dave Harris to join a Gypsy Jazz trio they had recently set up and so Stephane Grapelli came back into my life in the shape of Djangologie, with whom I've now been playing for 15 years. 2003 - 2004 was a pretty busy year for me. I completed a Masters degree, recorded Djangologie's first album while heavily pregnant and gave birth to a son! Sometimes when I look back on the first few years with Djangologie it seems I was pregnant or giving birth most of the time! In 2006 we recorded a second album, and a couple of months later my daughter was born. Around about this time I played with The New Century Ragtime Orchestra for the first time and got a taste for an earlier style of jazz violin and the joy of sitting in a jazz orchestra. I'd always loved the 1920s as an era; Charlestons, flappers, PG Wodehouse, F Scott Fitzgerald ....and this music was feeding that fascination! I'd always known the music, probably mainly from films, but I wasn't aware of the Classic Jazz scene. When in 2010 Mike Durham asked me if I would like to play with Keith Nichols at The Sage in a concert celebrating the great British Dance Bands, I couldn't believe my luck. During that concert I really felt I was living a fantasy - I loved the music so much and the musicians I was playing with were amazing. I think I had a grin on my face for the entire performance. I have joined Keith and his orchestras/ bands on numerous occasions since and it is always a treat. 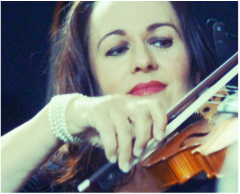 Over the past few years I have continued to enjoy playing Hot Club and Gypsy Jazz with Djangologie as well as playing a wider range of classic jazz at festivals and jazz parties with many wonderful musicians. As the babies are getting older I'm also finding the time to start some new projects of my own - a new Hot Club band with James Birkett, David Harris and Bruce Rollo; a Venuti/ Lang inspired duo with guitarist James Birkett and a violin/piano duo with Paul Edis. Having the opportunity to play regularly with such top class musicians and be part of the the North East jazz scene with its wonderful audiences and venues is a real blessing. I've also been very fortunate to have the opportunity to play at a variety of festivals and clubs around the country with many wonderful musicians. Looking forward to seeing where things go from here!